When you have a lot to gain, you have a lot to lose with a sub-par translation. Quality translation speaks volumes about you as a professional, scholar, or business. According to an English study, 82% of those surveyed would not use a company that hadn’t correctly translated its online and marketing material into English. My experience and professionalism will help make you look good, get hired, get published, or sell your products or services. Finding a good freelance translator can be a challenge (follow my advice here). Many of my new clients come to me after having first gone elsewhere and gotten substandard work. It is often a client or a partner who tells them the translation is bad. They are embarrassed and have to pay again to have it done properly (bad translations are better scrapped than revised). In our globalized age, shoddy translation gets found out sooner or later. Since 2000, when I began my full-time career as a professional translator from Italian to English, I have translated dozens of books, hundreds of magazine articles, and virtual mounds of websites, brochures, catalogues, letters, academic proposals, blogs, and official documents. 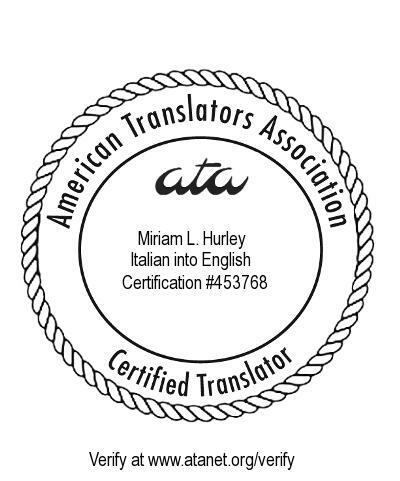 I am certified to translate Italian to English by the American Translators Association. Certification is earned by passing a difficult proctored exam that is peer-graded and passed by less than 20% of those who try. I passed it the first time I took it in 2001. Continuing education is required to maintain ATA’s prestigious certification. You can verify my certification with my certification number #453768. More about ATA certification. Translation is a highly specialized skill. Like all skills, it is honed over time but needs raw talent at its foundations. This means, before all else, superior writing skills in one’s native language. It means being able to glean the feeling and intent behind words beyond just their “meaning.” A third important skill is research, knowing how to find the right answer in our excessive-information age. Happily, these skills and talents are mine. Professionale, precisa, veloce. Disponibilissima al dialogo e al confronto per la migliore riuscita del lavoro, la Dott.ssa Hurley ci ha piacevolmente colpiti per la capacità di cogliere ed interpretare le sfumature meno banali della lingua italiana, nonché per il rispetto dei toni e dei ritmi del racconto. Lo Stile del testo é elemento sfuggevole che Miriam, forte di un vocabolario ricchissimo e di una conoscenza delle grammatiche semplicemente rara, ha il dono di saper ricreare in inglese. Hello Julia, I translate from Italian to English (my native language). If you email me, I could suggest some English to Italian translators.